Americans go to the polls next week. But in one California town, the fiercest debate isn’t whether Republicans or Democrats triumph in midterm elections, but over the legacy of a long-dead president, William McKinley. Citizens will vote on Tuesday on whether to remove a century-old statue from their town square of the “Napoleon of Protection”, who was assassinated in 1901. The fight in Arcata, a burg in the northern California county best known for its marijuana production, centers on McKinley’s support of America’s colonial adventures abroad and the poor treatment of Native Americans while in office. That’s a worthy discussion for the community to have. But it overlooks a question of national import: McKinley’s role as the first Republican to capitalize on protectionism. Arcata’s McKinley referendum comes as President Donald Trump embarks on what may be the biggest American counterpunch to the international exchange of goods, services and capital since 1930. Then, two Republican legislators, Willis Hawley and Reed Smoot, imposed tariffs on some 20,000 imported goods, an act that economists believe exacerbated and maybe even triggered the Great Depression. Trump has imposed tariffs on $250 billion of Chinese goods and is considering raising them on $267 billion more. McKinley’s contribution to protectionism can be traced back to the Tariff Act of 1890, which the Ohio congressman championed as head of the House Ways and Means Committee. The bill, which introduced tariffs that were popularly named after him, raised the average tax imposed on imports of products like tin plates and woolen goods to 49.5 percent. That was fantastic news to American manufacturers, who with the stroke of a pen became more competitive relative to rivals, particularly in the United Kingdom. The costs, as with all tariffs, were ultimately borne by consumers. And the people revolted, arguably costing Republicans the presidency two years later, when Democrat Grover Cleveland defeated Benjamin Harrison, and returned to the White House for the only non-consecutive presidential term. The political implications of the tariffs continued for years. Cleveland railed against them. Their deleterious economic effects contributed to the Panic of 1893, which lasted for some four years, led to hundreds of bank failures and unemployment rates of more than 30 percent in some states. It also sparked one of the first economic protests in American history when Jacob Coxey, an Ohio businessman, rallied “Coxey’s Army” to march on Washington. As Karl Rove notes in his biography “The Triumph of William McKinley”, by reducing imports the tariffs also reduced the flow of gold into the Treasury. Cleveland in 1895 was forced to turn to J.P. Morgan for help. He guaranteed the sale of $65 million of bonds to bail out Uncle Sam. The Democrats were blamed for the economic downturn, allowing McKinley to win the presidency in 1896. It’s perhaps not surprising that the debate in Arcata is over race and imperialism during McKinley’s time in the Oval Office, rather than his economic track record. The town was the first to elect a majority of its city council members from the Green Party, and banned the growth of genetically modified organisms within its borders. Those in favor of removing his statue, including the Wiyot Tribal Council, say McKinley supported the dismantling of what were then known as the Five Civilized Tribes – the Choctaw, Creek, Chickasaw, Seminole and Cherokee. By contrast, another statue of McKinley 3,000 miles away has engendered no such rancor. The town of Adams, Massachusetts celebrated McKinley on the centennial anniversary of its unveiling, even employing an impersonator to re-enact some of his speeches. 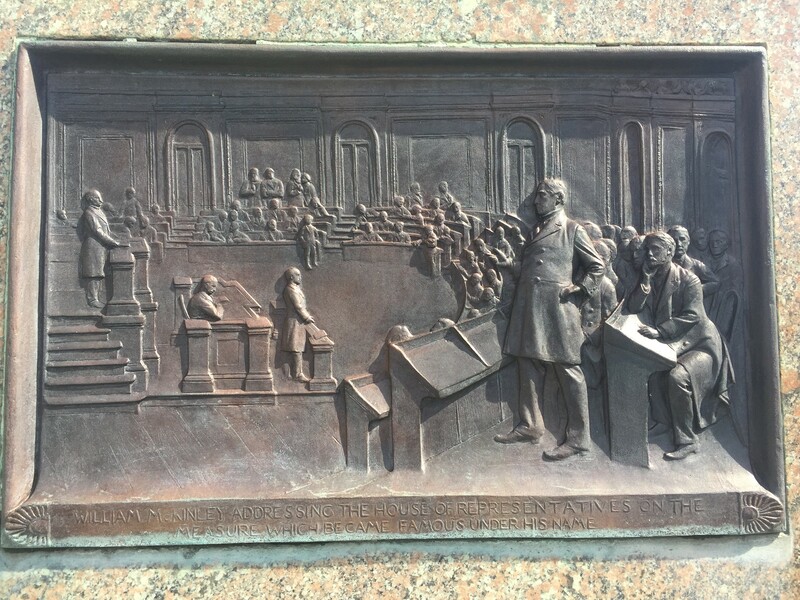 Reliefs on the memorial, which was erected in 1903, recount McKinley’s economic triumphs. According to the town’s historical society, McKinley visited three times, once as Ohio governor to dedicate a textile mill and twice as president. There’s another parallel with today’s tariffs. Visiting Adams, McKinley reveled in the adulation of the workers at the Berkshire mills – and their owners, the Plunkett Brothers – who benefited from his raising the cost of imported cloth. The mills eventually closed. In 1958, the last cotton plant in western Massachusetts was shuttered, putting 1,000 locals out of work and ending 150 years of textile manufacturing there. Today, the town’s unemployment stands above the national rate, and household income is just two-thirds the U.S. average. It’s hard to say whether Adams would have fared better over time without tariffs. But there’s an encouraging Schumpeterian coda. Berkshire Fine Spinning Associates merged with Hathaway Manufacturing in 1955. A few years later, a young investor named Warren Buffett began buying up shares of the company, renamed Berkshire Hathaway, and over time ditched the textiles business. It’s now worth half a trillion dollars. No president can dampen the capitalist urge for long. A plaque at the base of a statue of William McKinley in Adams, Massachusetts.